"Past Tense Verb 'Be' Questions/Answers"
"Past Tense, Contrast "Be" and "Do"
Real English 7, "What's Your Astrological Sign?" Real ESL English 8, How to order coffee. Real English 9, "Could you tell me the time?" Real English 10. This is the Jones family. Real English 11, "Are you married?" Real English 12, "Let's talk about the weather." Real English 13, People Outside. Real English 15, "What can you do?" When this unicorn's horn reached the stars, beautiful singing could be heard. Did you know that there was a time, years ago, when the stars in the sky used to sing? Many years ago, the stars sang because of a unicorn. 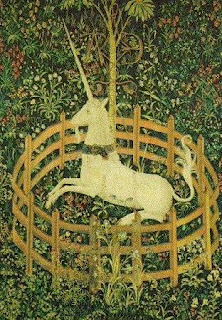 The unicorn lived in a large forest near a small village in England. 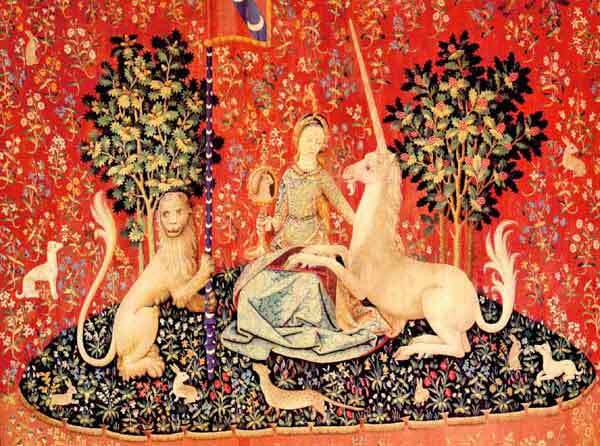 Even in those days, unicorns were very unusual creatures. And this one was unusual even for a unicorn. His horn was so long it reached up into the sky. When his horn touched the stars, they would start to sing. During the day, the unicorn would graze. He ate grass, berries, and the wild flowers that grew in the forest. At night, he sµt on the ground with his head raised to the sky as he smelled the sweet, fresh air. His horn would graze the stars, and then the stars sang. Sad people became happy when they heard the stars singing. Babies stopped crying and fell asleep when they heard the stars singing. People who were ill began to feel better when they heard the stars singing. "Life would not be the same without the unicorn," everyone said. One afternoon, as the unicorn grazed in the forest, he noticed a girl sitting on a stone and crying. The unicorn was a friendly creature with a kind heart. He couldn't stand seeing anyone cry. So he asked, "What is your name, little girl, and why are you unhappy?" The little girl was so astonished to hear the unicorn talk that she stopped crying. She wiped her eyes with the yellow stole she wore around her neck. "I'm Elsie," she said shyly. "I've lost my bracelet and I can't find it. My father will be angry with me. He carved it just for me out of wood," she explained. "I know what we can do," the unicorn said. Your father can make you another bracelet from a piece of my horn. Cut off a little bit. It won't hurt me. But, please, promise me that you will not tell anyone where you got the horn. "Thank you, dear unicorn. I promise not to tell anyone. And I have a gift for you. Here is my yellow stole." And off she ran, leaving the unicorn to wonder what to do with the scarf hanging from his horn. Elsie ran home to show the unicorn's gift to her father. 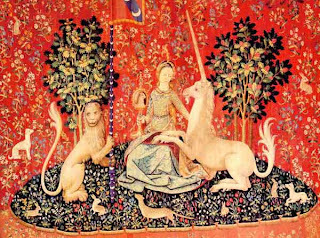 She was so excited that she forgot her promise to the unicorn. She told her father how she happened to have a piece of unicorn horn. Her father made her a new bracelet that was even more beautiful than the old one. Elsie's father was a cobbler, and while he worked on Elsie's bracelet, he had been thinking of the wonderful shoe buttons he could make from the unicorn's horn. 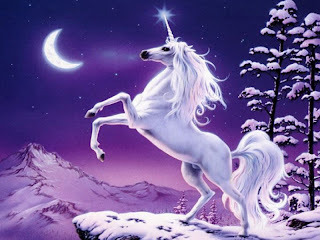 Finally, the cobbler went to the unicorn and said, "Please, dear unicorn, I am a poor cobbler. If I had a piece of your horn, I could make wonderful buttons for my shoes. Many people would want to buy them. I would be able to have more money to buy food and clothing for my wife and children. The unicorn sighed. He thought, "How hard it is for people to keep a secret." But he felt sorry for the cobbler and let him cut a few inches off his horn. The cobbler sold many pairs of shoes made with buttons from the unicorn's horn. Soon, everyone in the village knew how the cobbler was able to make such wonderful buttons. 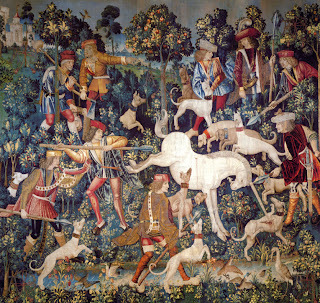 Many people went to the unicorn, asking him for bits of his horn. They wanted the horn to make things like rings and bracelets and combs and boxes. At first, the unicorn let the people have all they wanted. But then he begged them to leave him alone. Then the mayor of the village heard about the people going to the unicorn. He ordered them to stay away from the unicorn. But people went to the unicorn anyway. While he slept, they stole pieces of his horn. The more they stole, the shorter the unicorn's horn became. It became too short to reach the sky. The unicorn's horn was no longer able to graze the stars, and they stopped singing. The people of the village were very unhappy. They knew that they had lost their lovely night music because they were so greedy. But it was too late to do anything about it. a. when the moon came out. b. when the unicorn's horn grazed them. c. because they were twinkling. a. looked just like other unicorns. b. lived in the zoo. c. was kind and friendly. d. was unpleasant to everyone. a. had lost her bracelet. c. had lost her way in the forest. d. had a fight with her father. a. to come back again. b. to give him her money. c. that she would keep a secret. d. that she would not hurt him. a. everyone kept away from the unicorn. b. the unicorn was locked in jail. c. the people stopped buying shoes. d. some people stole from the unicorn anyway. a. he looked like a cow. c. life was no longer the same. d. the people were happy. a. "What to Feed a Unicorn." b. "How Elsie Got a Bracelet." c. "How the Unicorn Got a Stole." d. "The Unicorn Who Gave Too Much." a. greed makes people destroy nature. b. unicorns make good pets. c. stars don't really sing. d. things were better in the old days. Prepare for the job fair on May 11, Room 109, Mission Campus, from 11am to 3pm. You can use these dialogues to prepare for your interview. Here is James ESl from Canada: "Giving Directions"
Click on the following link. The text of the test will open in a new window. It is a "pdf" file. It's a one hour test giving you the feeling of true "immersion" in the English language. I think also that you will find it to be a lot of fun. Don't translate! If you translate into your language, it will slow you down. Send your translator out for a cup of coffee. DOUG JOHNSON: And I’m Doug Johnson with People in America in VOA Special English. Today we tell about a young woman named Virginia Patterson Hensley. No one but her family would remember that name. The world remembers her as Patsy Cline. SHIRLEY GRIFFITH: That song is called "Walkin' After Midnight." It was Patsy Cline's first big hit record. She recorded it in nineteen fifty-seven. It became number three on the list of country music hit recordings and number twelve on the list of most popular music. Album cover from Patsy Cline's "Definitive Collection" album. Patsy had worked for many years to make that first successful record. She began singing when she was a young girl in her home town of Winchester, in the southern state of Virginia. Patsy sang anywhere she could. She sang at weddings and dances. She sang at public eating places for eight dollars a night. Those who knew her said she worked hard to improve her singing. In nineteen fifty-four she won a country music competition near her home. She was twenty-two years old. She was asked to appear on a country music television program in Washington, D.C. She also sang on radio programs in the Virginia area and recorded some records. 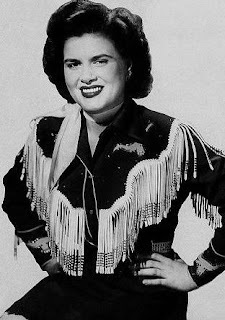 DOUG JOHNSON: In nineteen fifty-seven, Patsy Cline appeared on a national television show in New York City. It was on this program that millions of people first heard her sing. She sang "Walkin' After Midnight," a song she had recently recorded. Her appearance on the television program helped make that record a major hit. Patsy continued to record more songs. Within two years she had another major hit. It was called "I Fall to Pieces.” By this time Patsy's voice had already become something special. She had learned to control not only the sound but the feelings expressed in her songs. It was the slow, sad love songs that her fans enjoyed most, songs like "I Fall to Pieces." Album cover from Patsy Cline's "Sweet Dreams" album. SHIRLEY GRIFFITH: Patsy Cline's recording of "I Fall to Pieces" became her first number one country music hit. It was also a hit with fans of popular music. Patsy was a major star. She also had begun performing at the country music theater, the Grand Ole Opry in Nashville, Tennessee. "Crazy." It was written by an unknown musician who later became a major country music star. His name is Willie Nelson. If you listen carefully to Patsy Cline's recording of "Crazy," you can hear the beautiful piano playing of another young musician, Floyd Cramer. He also became a major recording star. Listen to Patsy and Floyd perform Willie Nelson's song, "Crazy." DOUG JOHNSON: On March sixth, nineteen sixty-three, Patsy Cline was killed in the crash of a small airplane. She was only thirty years old. She was flying home to Nashville. She had taken part in a special concert in Kansas City to raise money for the family of a country music radio performer who recently had died. Patsy Cline was buried near her home town of Winchester, Virginia. Thousands of people came to her funeral. Ten years after her death, she became the first woman performer elected to the Country Music Hall of Fame. SHIRLEY GRIFFITH: In nineteen eighty-five, Hollywood producers made a movie about the life of Patsy Cline. It was called "Sweet Dreams. " Popular actress Jessica Lange played Patsy. No one really could sound like Patsy Cline. So the producers used her old records in the movie. Ms. Lange moved her mouth so she appeared to be singing. People who had never heard of Patsy Cline saw the movie and enjoyed her singing. They began buying her records. Today, her records still sell thousands of copies each year as new fans discover her. We leave you with a song Patsy Cline recorded only a month before she died. It sounds almost as though she was singing in Special English. The song is called "Faded Love." DOUG JOHNSON: This program was written by Paul Thompson. It was produced by Lawan Davis. I'm Doug Johnson. SHIRLEY GRIFFITH: And I’m Shirley Griffith. Join us again next week for People in America in VOA Special English. STEVE EMBER: And I’m Steve Ember with PEOPLE IN AMERICA in VOA Special English. Today we tell about Bob Feller, one of the best pitchers in the history of American baseball. BARBARA KLEIN: Those were the words of Bob Feller, talking about his pitching. Robert William Andrew Feller was born in nineteen eighteen in the small town of Van Meter, Iowa. He grew up on his family’s farm nearby. When he was not working in the fields, Bob was throwing a rubber ball against the side of a barn. Or playing catch with his father. STEVE EMBER: Bob played baseball in high school. At the age of sixteen, he secretly signed an agreement with a major league baseball team, the Cleveland Indians. He received one dollar and a baseball signed by the Cleveland players. Bob Feller became a professional baseball player at the age of seventeen while he was still in high school. He never pitched in the minor leagues, as most players do today. In July of nineteen thirty-six, he pitched in an unofficial game against the St. Louis Cardinals. He struck out eight batters. None of them were able to hit the balls that Feller threw. The next month, he struck out fifteen batters in a game against the St. Louis Browns. BARBARA KLEIN: In September, Bob Feller pitched against the Philadelphia Athletics. He tied the major league record of striking out seventeen players in one game. Before his first season had ended, the New York Times reported that Bob Feller’s name was “on the tongues of a million fans.” He was said to be the best-known young person in America. At the end of the season, Feller returned to his hometown for his last year of high school. NBC radio broadcast his graduation from Van Meter High School nationwide. He was on the cover of Time magazine at the age of eighteen. STEVE EMBER: From the late nineteen thirties to the late nineteen forties, Bob Feller was called the best pitcher in major league baseball. He threw the ball harder than any other pitcher of his time. He was known for his fastball. People sought to measure its speed using different methods. It was measured at between one hundred fifty-seven and one hundred seventy-two kilometers an hour. Because of his fastball, Bob Feller had several nicknames, including “Rapid Robert” and “Bullet Bob.” He won one hundred seven major league games before his twenty-third birthday. Experts said Bob Feller was baseball’s most exciting player since Babe Ruth in the nineteen twenties. Hall of Fame pitcher Bob Feller signs a baseball for Navy Captain Frank McCulloch. BARBARA KLEIN: Bob Feller pitched on the final day of the nineteen thirty-eight season against the Detroit Tigers. He struck out eighteen hitters to set a new major league record. Today, the record is twenty. In nineteen forty, he became the first American league pitcher to throw a complete game no-hitter on opening day, the first game of the season. Then, on December seventh, nineteen forty-one, Japanese forces attacked the American naval base at Pearl Harbor, Hawaii. The United States entered World War Two. Two days later Bob Feller halted his career to join the Navy. He was the first major league baseball player to volunteer for military service. He served as the chief of an anti-aircraft gunnery crew on the battleship USS Alabama. He missed three full baseball seasons and most of a fourth. STEVE EMBER: Bob Feller returned to baseball late in nineteen forty-five. He recorded his best season the next year when he won twenty-six games. In nineteen forty-seven, Feller injured his right arm. He was never the same pitcher again. The Cleveland Indians won the American League championship in nineteen forty-eight. So Feller achieved his dream of pitching in the World Series. The Indians won the World Series against the Boston Braves, four games to two. Feller started both games that the Indians lost. However, three years later, he was the best pitcher in the American League, winning twenty-two games. BARBARA KLEIN: In the nineteen fifties, Bob Feller helped organize the Major League Baseball Players Association. He served as the group’s first president. He helped establish a pension plan to provide money for retired baseball players. Feller retired from baseball in nineteen fifty-six. He won two hundred sixty-six games in eighteen seasons with the Cleveland Indians. He led the American League seven times in strikeouts and six times in victories. He pitched three games without any of the batters getting hits. And he pitched a record twelve games when he permitted only one hit. Bob Feller's powerful right arm earned him the nickname 'Rapid Robert' and made him one of baseball's greatest pitchers. STEVE EMBER: Bob Feller was elected to the Baseball Hall of Fame in Cooperstown, New York, in nineteen sixty-two. Seven years later, professional baseball celebrated its one hundredth anniversary at the All-Star Game. Feller was honored as baseball’s greatest living right-handed pitcher. He spoke out about protecting baseball’s standards of fairness. He opposed admitting players to the Hall of Fame if they had used performance-enhancing drugs. 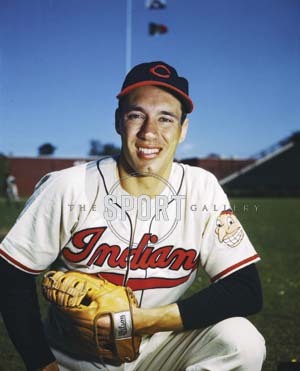 BARBARA KLEIN: Bob Feller continued his connection with the Cleveland Indians as a “goodwill ambassador.” He appeared at the team’s spring training games. He helped train young pitchers. He played catch in the field while wearing his easily recognizable number nineteen uniform. He also talked to baseball fans, often signing balls or pictures of him as a player. Feller often appeared at the team’s “Fantasy Camps.” This is where baseball fans pay a lot of money to spend a week playing baseball with former players. In two thousand nine, at the age of ninety, he put on his Indians uniform one more time. He pitched to three batters in the first Baseball Hall of Fame Classic, a game in Cooperstown between former major leaguers. Several people wrote on Facebook about what Bob Feller meant to them. Here are some of those comments. BARBARA KLEIN: This program was written by Shelley Gollust and produced by Dana Demange. Christopher Cruise was the voice of Bob Feller. I’m Barbara Klein. STEVE EMBER: And I’m Steve Ember. You can find scripts and audio of our programs at voaspecialenglish.com. We are also on Facebook, Twitter and YouTube at VOA Learning English. Join us again next week for PEOPLE IN AMERICA in VOA Special English. The two TH consonant sounds. These sounds are paired together because they take the same mouth position. The unvoiced TH, as in thin, is made by only letting air pass through your mouth. The voiced TH, th as in this, is made by, th, making sound with your vocal cords. Th and th. They are made by letting the tip of the tongue come through the teeth. Everything else stays very relaxed: the lips are relaxed, the jaw is relaxed, the tongue is also relaxed, though it does come forward. Here we see the TH sound on the right compared with the mouth at rest on the left. And with parts of the mouth drawn in. The soft palate is raised for this sound. You can see the tongue through the teeth, just the tip comes through. The TH consonant sounds. Sample words: thin/this, thief/these, birthday/worthy. Sample sentence: I thought of using these Lily of the Valleys rather than those thorny roses. Now you will see this sentence up close and in slow motion, both straight on and from an angle, so you can really study how the lips and tongue moves when making this sound. I, with the 'ai' as in 'buy' diphthong. Thought, tongue tip through the teeth, TH. 'Aw' as in 'law', tongue up to make the T which is a D here, thought of. Using, the 'ew' as in 'few' diphthong. These, tongue tip through theteeth . Lily of the Valleys, tongue up in the L position, comes down, 'ih' as in 'sit', back up for the second L, lily, of, bottom lip up for the V sound, and again for the V sound of Valleys. Tongue up for the L, that was an L, not a TH. Rather, lips take the R consonant shape, and the tongue comes through the teeth again for the TH, one more time quickly for than. Those, 'oh' as in 'no' diphthong, and again for thorny, thorny roses, R consonant shape, 'oh' as in 'no' diphthong. Teeth together for the Z sound, then part slightly for the schwa, and then together again for the final Z sound. And now from an angle. I thought, tongue tip through the teeth, tongue up to make the D sound, bottom lip up for the V. Using, with the 'ew' as in 'few' diphthong. These, tongue tip through theteeth. Teeth together for the Z sound and tongue up to make the L. Lily, up again for the second L. Lily of, bottom lip up for the V. And you don't even seen the tongue for the TH there because it's so quick. Of the Valley, Valleys. Rather,mouth takes the R consonant shape and the tongue tip comes through for the TH. Rather. Tongue tip comes through quickly to make than and those, than is very short there. 'Oh' as in 'no',teeth together for the Z sound. Thorny, tongue through the teeth for the TH, tongue up to make the N, roses. R consonant shape, teeth together for the Z sound, part for the schwa, and together again for the Z sound.